Last day of camp. Here we are. It's been a fantastic summer. So many wonderful campers joined us this summer and we all had a blast. 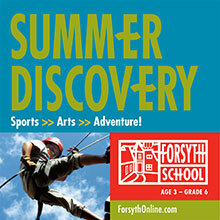 Thank you for being a part of Forsyth Summer Discovery 2015. 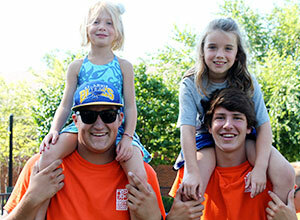 We had as much fun as the kids! Thank you to these Forsyth colleagues who led camps: Deborah White, Beckii Pittman, Regina Stone, Justin Harris, Joe Kaminski, Donna Militello, John McGinley, Gerri Meesey, Meredith Harris, Leah Hooper, Liz Alessi, Julia Wilkins, Ryan Howard, Claire Winkeler, Sheree Sodipo, Amy Hudson, Christine Torlina, Gary Schimmelpfenig, Rick Downs, Susan Zareh, Kathy Becker, Anne Reinholdt, and Beth Maglasang. Thanks as well to Kennedy High School Chemistry & Physics teacher Jim McQuaide, whose rocketry and chemistry camps are big hits. Forsyth alums Amanda Zeigler and Josh Gollub led Little Medical School. Both are headed into medical careers. We had 10 Forsyth alumni working this summer, including Tess Hannum, FS '09, who ran the School office this summer. Thank you to all of our great counselors. They played hard, were great with kids, and went above and beyond in so many ways. For 8 years, camp directors Barb Alexander and Adam Meesey have led Summer Discovery and it gets better every year. What's not to love about the bunch below? This team closed out the last session of camp. Hope to see you again next summer!